Music has always been around me. As a kid, I grew up with the sounds of Petra, Michael W. Smith, DC Talk, the Newsboys, and Steven Curtis Chapman mixing alongside Kansas and Rush. As a teen, I discovered Skillet, Relient K, and Kutless while playing flute in an orchestra and singing in a classical choir. So it’s no surprise that music has played and continues to play a large part in my writing process. I don’t remember when I first started listening to music as I wrote. I used to listen to it a lot when I was brainstorming or before I wrote certain scenes. I have a very strong memory of being fifteen and listening to a song from the first Pirates of the Caribbean soundtrack before writing a pirate scene. I do remember the summer I was seventeen, I received my first laptop and my first mp3 player, and from then on, every time I was writing, my earbuds were glued to my head. I recently went back through one of my old stories that I wrote as a teenager, HalfBlood, about a guy who became a dragon rider. There are still scenes in that book where I remember exactly what part of The Lord of the Rings soundtracks I was listening to as I wrote them. Despite my husband’s assurance and support, those voices were loud. So in order to shut them up, I took to blasting music with lyrics in my earbuds. That had some really funny results at first–sometimes I would forget what I was doing and begin writing down the lyrics of the song at first. 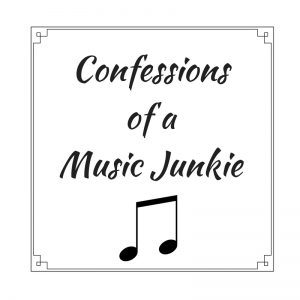 It definitely took time to get used to writing to music, but after a while I discovered that I could get into a zone where my guilty thoughyts and the music would kind of fade into a background noise, and my brain was free to spill onto the page. It also had an effect I wasn’t anticipating…sometimes, if the scene and the song worked together, it ramped up the emotion in the scene dramatically. About the same time, I began watching the TV show Supernatural. Not only did it renew my love of classic rock, but I started noticing how the songs would fit with the scenes. Between watching it work on a TV show and watching it work in my own writing, I knew I had to leverage this. I began YouTubing and Googling artists that writing friends suggested, then moving on to the artists suggested by those lovely Internet algorithms once they figured out I loved Audiomachine and Skillet. Nowadays I’m on Spotify, and I often given their suggested playlists at least a onceover, even if it’s not necessarily my genre. These days, I rarely write without music. One of the first things I do when I begin to brainstorm and plot a story is to build a playlist for it. The playlist, just like the storyline, is allowed to evolve and grow as my vision for the story solidifies. Sometimes I find songs that surprise me–I had no idea I’d be sticking a dubstep song into the classic rock and symphonic metal playlist I’d built for my urban fantasy series, but it just fit. I usually end up with an eclectic mix, some of which reminds me of certain characters or iconic scenes, and some of which just sets the mood for the story, but the playlist generally becomes so necessary that I can’t write without it. It’s fun to see that other writers occasionally do this as well. During a recent re-read of a Brandon Sanderson novel, I discovered he’d created a playlist for his third Stormlight Archive book. I immediately turned it on as I re-read those novels and enjoyed how well most of the songs fit into his words on the page. There’s just something so cool about snuggling down with a book and a playlist of songs specifically put together for that book–the author’s own personal soundtrack to their story. I love how songs can help set me into the tone and feel of a scene, or how the lyrics can provide an even deeper meaning to a character’s feelings. As a reader, do you ever listen to authors’ playlists while you read their books? H.A. Titus is usually found with her nose in a book or spinning story-worlds in her head. 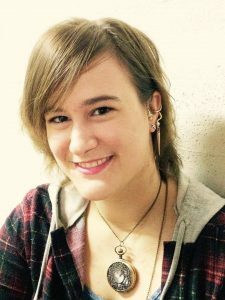 She first fell in love with speculative fiction when she was twelve and her dad handed her The Lord of the Rings. She lives on the shores of Lake Superior with her meteorologist husband and young sons, who do their best to ensure she occasionally emerges into the real world, usually for some kind of adventure. When she’s not writing, she can be found rock-climbing, mountain biking, or skiing. She is the author of the Celtic urban fantasy Forged Steel. I get very excited whenever one of my critique partners, past or present, achieves their dreams in one way or another. So I have to take some time to support them and spread the word. Today, fellow fantasy writer and all-around fun gal H.A. 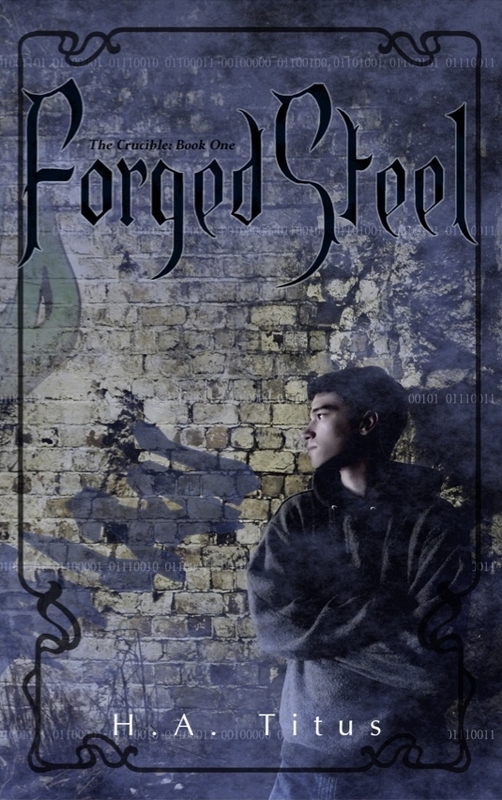 Titus is having a cover reveal for her novel, Forged Steel. Now, I got to see this story in its early stages, so I can weigh in on how great the story was back then. I can’t wait to see it now! Downton. Coffee shop. 2 AM. One minute, Josh is firing off sarcastic remarks at his best friend Marc – the next, they’re running from shape-shifters. Apparently, even best friends don’t share all their secrets. Now Josh is in danger. He can see the monsters among the humans. And all Josh wants to do is get out before it’s too late. 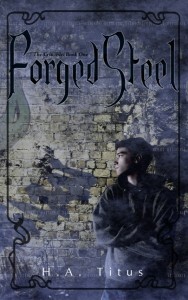 Forged Steel is a new adult urban fantasy by H. A. Titus, releasing on July 17th. It will be available in print (Amazon) and ebook (Amazon, Barnes & Noble, Kobo, iBooks, and Scribd) If you’d like a chance to win free books, ask questions, and hear trivia about the writing/publishing of Forged Steel, there will be a Facebook event party on July 17th from 7-9 pm eastern time on the author’s page, H. A. Titus Author. The first five chapters are available for preview on Wattpad.